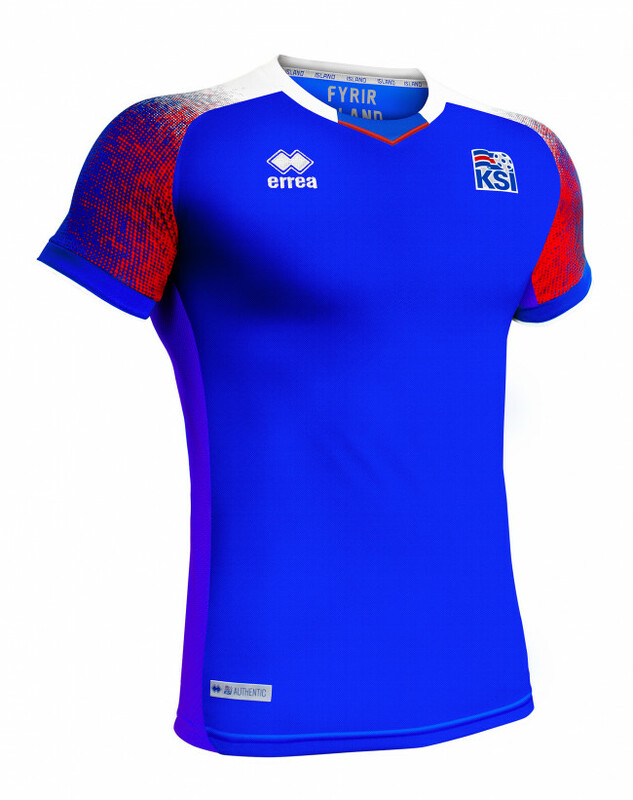 ICE, WATER, FIRE AND GEYSERS: ONCE AGAIN THE NEW KITS DESIGNED BY ERREÀ FOR THE ICELAND FOOTBALL TEAM HAVE BEEN INSPIRED BY NATURE'S ELEMENTS A land covered in ice with an immense wealth of water and a heart of fire thanks to the huge number of volcanoes and geysers. 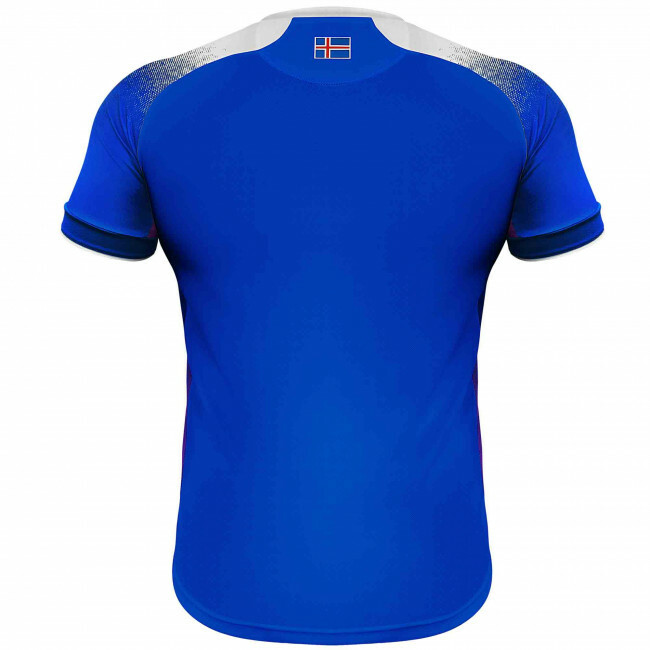 All of this can be found harmonized in the new kits which Erreà Sport has designed for KSÍ – the Football Association of Iceland and its first ever history making appearance in the FIFA World Cup. After the amazing adventure which saw them participating in France in the 2016 European Championships, a new strip, original but strongly linked to the identity of this nation, will accompany them to the 2018 World Cup in Russia. In fact ice, lava and water blend perfectly into the new Erreà designed jersey to best represent the uniqueness and beauty of Iceland and its National team. The fire which lights and warms the heart of this land and its people is the starting element for unveiling the new kit. Due to its effect, the ice, symbolically represented by the white on the V-necked collar and along the shoulders, slowly melts, mixing with the lava along the sleeves characterized by almost dot-like graphics where red and blue blend. Then blue representing the water that has melted thanks to the heat, is the distinctive colour of the main body and the background of the home strip with its simple and clean lines but perfect down to the smallest detail. The close fit is emphasized by the combination of two fabrics. The first, positioned in the central part of the jersey, is soft, breathable and extremely comfortable and is embellished and combined with a second yarn, a special mesh placed along the sides of the jersey. In an emblematic way, the mesh fabric sewn along the edges, reveals the underlying fabric which, in the case of the home strip, is red, as if to underline that under the blue colour of the jersey and the player's skin there flows the omnipresent power of fire and the beating heart of passion. 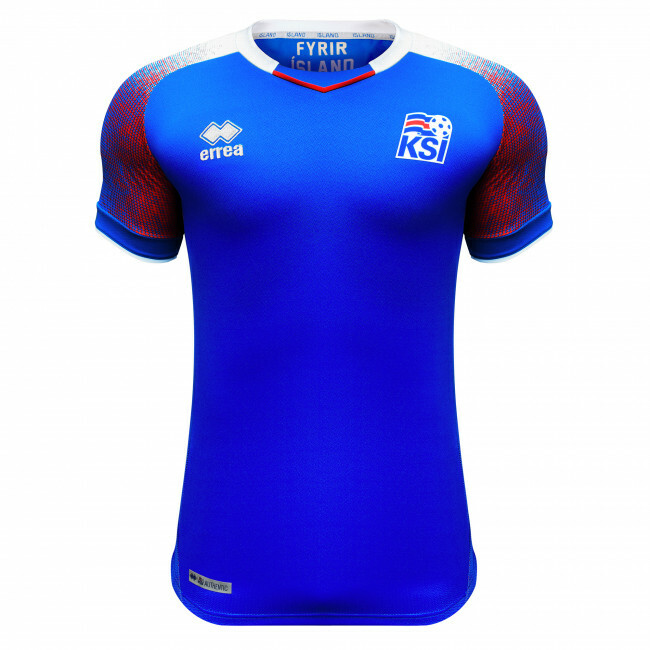 To emphasize the strong national identity, the pride and the intense sense of community that distinguish the Icelandic people, there are two iconic elements included in the new kit: the motto already present for the 2016 European Championships "FYRIR ÍSLAND" ("For Iceland") positioned inside the neck and the national flag on the back of the jersey. On the other hand, the away strip is predominated by white representing the ice, while still keeping the coloured graphics that characterize the sleeves in such an original way. White is also the colour of the mesh along the sides of this second variation, where the element showing from underneath is the blue of the water. Blue is also the colour chosen for the jersery numbers and names. There are three goalkeeper jerseys designed with identical graphics and the same stylistic motifs but produced in different colours: black, red and a never before seen purple. The white, red and blue band, inspired by the melting and mixing of ice, lava and water, is found, however, as a characterizing feature on the whole team line, leisurewear and training kit included. The new kit and the whole communication campaign is accompanied by the claim "Legends are born without warning" coupled with the powerful and epic image of geysers, some of the most surprising and spectacular phenomena on the surface of the earth. Rare and found only in certain areas of the world, including Iceland (the land par excellence for these incredible springs) geysers epitomize the strength and energy of this National team that has managed to weave organization, dynamic play and a great energetic spirit into its own particular identity. A team that can no longer look upon itself as a mere "splendid outsider" but one which in a very short time has managed to win the attention, favour and spotlight of the world scene. All this with the impressive power and explosive force of a geyser. The new KSÍ kits,like all Erreà garments, are Oeko-Tex Standard 100 certified. This prestigious certification, obtained by the company in 2007as the leading European company in the teamwear sector, guarantees that all Erreà fabrics and products are neither toxic nor harmful to health, in compliance with the most important international regulations and in observance of the highest and most recognized quality and safety standards.